Relax & enjoy this beachfront house (sleeps 6) - Book early to ensure dates! Let the breezy salt air and the sound of seagulls welcome you as you arrive at the Beal Beach House, situated on the sandy banks of pristine Admiralty Inlet. Leave the hustle-and-bustle of the big city with a breathtaking ferry excursion across famed Puget Sound and before you know it, you’ll find yourself at this comfy, yet spacious, beachfront getaway located in the quiet hamlet of Hansville, famous for its turn-of-the-last-century lighthouse. House Features & Amenities: You'll feel right at home as you enter the Beal family beach house. Relive traditions or create new ones as you settle in to this cozy, yet spacious three-bedroom waterfront home. You'll be entranced by the panoramic water views from the living room and wrap-around outdoor deck. For those who still need the modern conveniences of daily life, the house is equipped with WIFI, TV, DVD player, DVD movies, washer, dryer, microwave oven, toys and games. If you're seeking to escape from life's daily hustle-and-bustle, you can choose something to read from one of the bookshelves or grab your kindle and sink into one of our comfy chairs and read to your heart's desire. Or just lose yourself in the ever-changing seascape views that seem to engulf the horizon. Has the fresh air stirred up your appetite? Tickle your inner culinary talents with the fully-stocked kitchen filled with pots 'n pans of all sizes as well as dinnerware, utensils, wine glasses, bowls and mugs. If you need to make a quick grocery or beverage run, you'll appreciate the local Hansville Grocery & Provisions Company, a short 2-3 minutes away. While you're there, you can also order in or take out an espresso, burger or ice cream cone at the companion Hansgrill, a favorite local spot for breakfast, lunch or dinner. Bedroom Setup: Sometimes we all need a little privacy. You'll appreciate the beach house's three separate full-size bedrooms -- two equipped with double beds and the third with a bunk bed. Clean linens are provided and additional blankets, pillows and towels are in the hallway linen closet. Hello and welcome to Beal Beach House. My name is Kristie Lodmell and I grew up in Walla Walla, Washington, where my family continues to farm and grow grapes for our family winery Lodmell Cellars. I graduated from the University of Oregon where I majored in biology and first worked at the U of O Molecular Biology Institute where I researched Drosophila (fruit fly) genetics. The experience later led me to work in biotechnology sales in the Pacific Rim, Asia. In 2009, I joined the family winery and to this day manage operations, sales and the Lodmell Cellars Tasting Room located in the historic Marcus Whitman Hotel in downtown Walla Walla. I have fond childhood memories of Beal's Beach House. I learned how to salmon fish with my dad and berry pick with my mom. Jumping into the waves after a freighter passed by, playing in the sand, and exploring the low tide flats were always favorite things to do with my brother and beach friends! I know you will enjoy this magical place. Dr. Tearle Beal built 'Beal's Beach House' in 1978 as a family get-away from the City. Tearle graduated from the University of Washington School of Dentistry with my father, Dr. Miles Lodmell. Tearle was always part of our extended family and we traveled to Point No Point from Walla Walla every summer during my childhood. Tearle passed away in 2001 and my family purchased the property from his Estate. Our family continues to hold onto special memories of Tearle and Beal's Beach House. The place is magical and we are so happy to open up the place for others to enjoy! I have fond childhood memories of Beal's Beach House. I learned how to salmon fish with Tearle and berry pick with mom. Jumping into the waves after a freighter passed by, playing in the sand, and exploring the tide flats at low tide were always favorite things to do with my brother and beach friends! The beautiful views of Mt. Baker and the Cascade Mountain Range are stunning. I still love to sit on the beach with a good book, and sift the unique gray sand through my toes at water’s edge. There’s a great fire pit for roasting hotdogs and eating s'mores, one of our family tradition’s at the beach. Dining room table accommodates 8 by extending the leaves. I believe this is my 3rd or 4th stay at the Beal Beach House and it continues to be amazing. This has become my favorite getaway location. The management team is amazing! I cant wait to finally bring my family with me on the next trip! Cozy, waterfront bungalo with a fantastic view! Wonderful location, fantastic views, would definitely visit again! This house had everything we needed to spend a delightful weekend with our family! Very well appointed and comfy! The Beal House was great! 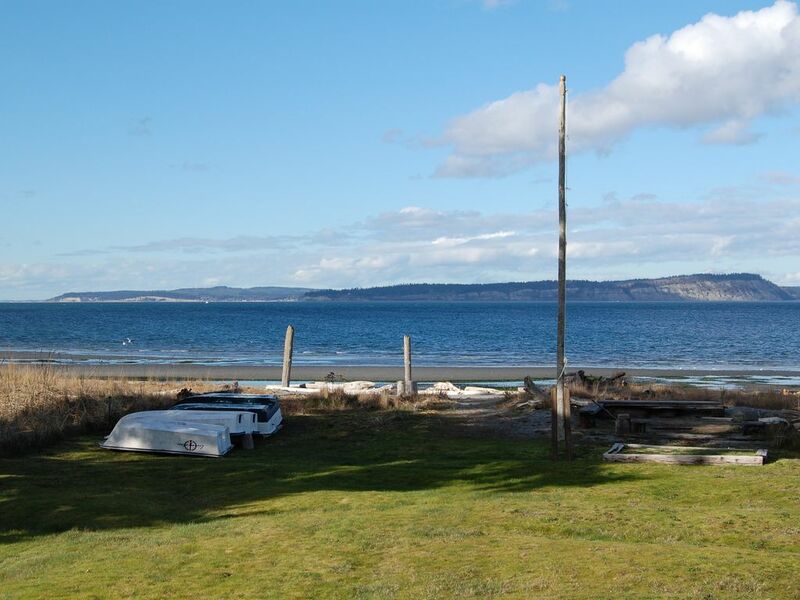 I stayed there with my family while visiting other friends in Hansville, the location on the beach is spectacular, the home is comfortable and well stocked, and checking in and out was easy - it was a seamless visit! Thank you! Such a great peaceful weekend getaway/retreat house. Owner was very responsive and kind, House was clean and comfortable. Would definitely stay here again. Overall, this is a great place to stay if you want great views, great access to the beaches, and to have a quiet getaway. It is close enough to ferries to Edmonds and Seattle for day trips, but removed enough to escape. I would certainly recommend it, but can’t quite give it five stars. The house is certainly older, but adequate for a place sleep. We had 5 of us (2 adults/3 teens) and it worked well. Our family has a lot of allergies and asthma and the house is a bit musty (as are most older costal homes), but it wasn’t too bad. While house and kitchen is stocked with some things, it felt a bit more like second hand and random leftover items. Overall clean and comfortable inside. Outside porches had lots of spider/cob webs. The modern conveniences advertised are a little lacking. While somewhat outside their control, the WiFi did not work at all. Owner was very responsive and tried to fix WiFi, but to no avail. The TV is small, cable channels very limited. DVD movies, books, games, etc. on hand are a bit random and dated, but available. I would definitely recommend this location for most people. I really wanted to give a five star, but wanted to give an honest review so others might benefit from a few slightly less than perfect elements. Again, nothing overly negative, just realities of what it is, a good quality 4 star location. We would certainly consider it his place again in the future. Owner is great, helpful, and friendly. Thank you! I know how busy life is and I thank you for taking the time to review your stay at Beal Beach House. Unfortunately, during your stay the Xfinity Main Internet line was compromised in the area and technicians were scheduled to visit the property, but could not access at the time. A technician arrived after check out and internet is completely restored. Hopefully, you were able to connect and work from the local Hansville Store that I recommended as a temporary fix. Summer to Fall brings the spiders quickly. We maintain as best we can against mother nature during this time of year! Again, thank you for taking the time to review, I truly appreciate your feedback and I apologize about the internet inconvenience.